It is Cyber Monday, and the discounts keep on coming. 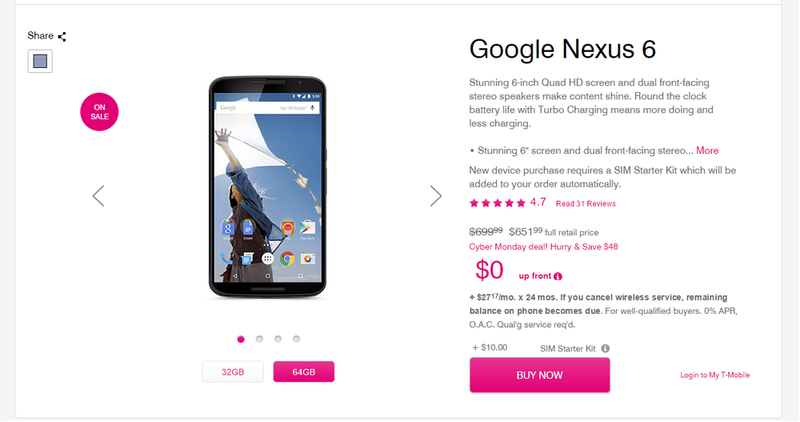 Not to be outdone by the Google Play Store, T-Mobile is knocking $50 off the 32GB and 64GB Midnight Blue Nexus 6 models for a limited time. If you do the math, that works out to about $600 and $650, respectively. Google’s running promotion will grant you a $50 rebate in the form of Play Store credits, but T-Mobile’s sticker price is the lowest we have seen. And remember that the Nexus 6 ships unlocked, meaning you are not tethered to T-Mobile if you choose to order from them – you can use the handset on another carrier, provided you have the SIM. Considering the handset was released only a few short weeks ago, the T-Mobile deal is an absolute bargain. Like most great bargains, though, it will not last long – it is valid only today. If you have not been able to secure a Nexus 6 yet, this is an opportunity to do so on the relative cheap.